Fakro electrically vented skylights are a great way to brighten up almost any room in your home while providing the option of circulating fresh air. This ENERGY STAR deck mounted skylight features bracket-free, one-person installation suitable for roof pitches between 15 to 85 degrees. A perimeter seal lines the solid wooden frame providing a "warmer" roof boarding-skylight frame joint. Once in the rough opening screws (included) secure the skylight to the roof deck, followed by your trusted brand of water and ice shield (sold separately) and finished with Fakro step or high profile flashing (sold separately). The single chamber glass panes are filled with argon gas and feature a Low-E coating to help filter UV rays. A mosquito screen, remote control, external rain sensor, template for cutting the rough opening, and installation hardware is included. Blinds and other Fakro accessories are available. 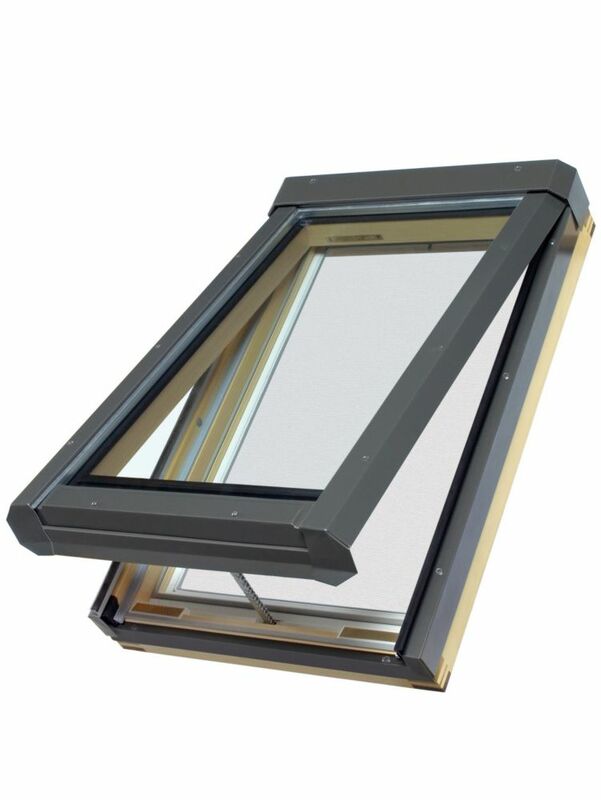 Made in Canada since 1955...The Columbia Venting Electric Elite Self Flashing LoE Clear glass skylight with remote and rain sensor includes a built in, removable bug screen, allowing for the combination of natural light with ventilation for maximum fresh air and temperature control. Excellent option for bathroom, kitchen, loft and attic rooms. No flashing or wood curb required, includes built in curb and flashing. Sun Tunnel Skylight - Model TMF (14") - Pitched with Flexible Tube. A Sun Tunnel Skylight is the perfect solution for hallways, bathrooms, kitchens, walk-in closets anywhere that would benefit from natural light, but does not require a view to the world. Sun Tunnel Skylights bring bright daylight into small spaces and rooms where traditional skylights are not an option. Easy and fast installation on all roof exposures. 24-inch x 70-inch FVE Electric Vented Skylight - ENERGY STAR® Fakro electrically vented skylights are a great way to brighten up almost any room in your home while providing the option of circulating fresh air. This ENERGY STAR deck mounted skylight features bracket-free, one-person installation suitable for roof pitches between 15 to 85 degrees. A perimeter seal lines the solid wooden frame providing a "warmer" roof boarding-skylight frame joint. Once in the rough opening screws (included) secure the skylight to the roof deck, followed by your trusted brand of water and ice shield (sold separately) and finished with Fakro step or high profile flashing (sold separately). The single chamber glass panes are filled with argon gas and feature a Low-E coating to help filter UV rays. A mosquito screen, remote control, external rain sensor, template for cutting the rough opening, and installation hardware is included. Blinds and other Fakro accessories are available.